Andy Awford has explained the reasons for Ricky Holmes’ Pompey exit. The Blues player of the season yesterday completed a whirlwind departure from Fratton Park as he agreed a loan move to League Two rivals Northampton. Holmes revealed his shock at being told he could go, with Awford stepping up his squad reshaping as the transfer window opens. The 27-year-old has failed to make the squad in the past three games and fallen down the first-team pecking order. Awford insisted he hasn’t completely closed the door on the man who arrived from Barnet last season. But he felt the move was the right one for both player and club. Holmes’ exit frees up a space in Awford’s squad and money in the budget, especially if the month’s loan is extended. Awford said: ‘I wasn’t going to stand in Ricky’s way. ‘But at the same time, I wouldn’t say he’s been bombed out. ‘Ricky is one who isn’t playing at the moment and is out of contract in the summer. ‘He needs to play football. ‘In the summer there will be hundreds of players out of contract. ‘This window will give people in our team and other sides the chance to go on loan. ‘They can do that until the end of the season and put themselves in the shop window. That’s what it does. ‘There are clubs who can only take players on loan at the moment. ‘They can’t take players on a permanent basis. ‘What they do say is we’ll take them on loan, have a look and then, if we like him and he likes us, we’ll look to do something in the summer. That is how it works this window. ‘Otherwise you’re in the mix at the end of the season and it’s harder for players. ‘If I’m not playing him he can play somewhere else and that then opens up a space. Holmes yesterday trained with Northampton ahead of a home clash against his former club Southend today. The winger, who has made 62 Pompey appearances and scored two goals, admitted his surprise at the move. 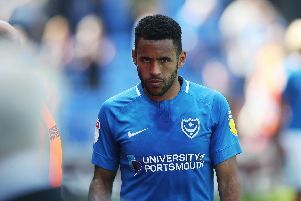 He said: ‘Portsmouth told me I could go out and get some games and it’s come from nowhere really. ‘I was playing every week and then we had a bad FA Cup game against Aldershot and they said they were going to look elsewhere. ‘I was completely surprised to leave. I played 45-odd games last season and I’d become one of the fans’ favourites so when the news comes out I doubt they’ll be happy. ‘But it’s been all change this season. The gaffer hasn’t really stuck with his signed players and there’s a big squad there, so he’s had to narrow them down.